Locks and parts sold on this page are old, originals that we've removed from trunks in our shop over the last couple of decades. through the center, etc., surface mount or mortise mount (needs a hole for the lock mechanism) and mounting holes usually line up with the originals. These are old - expect some rust and grime, please. Overall dimensions are 3" wide by 7-5/8" tall. Yes, they're green just like most army stuff, but these can be painted any color you'd like to slap on them. Heavy duty solid steel lock with steel tumblers. Comes complete with the lock, backplate, rivets and burrs for setting (or use our brass or steel nails), and one or two keys. Still packed in the original boxes from 1943. An excellent, heavy duty lock. Measurements overall for the complete unit when closed are 6 inches tall by 3.25 inches wide. These locks are $45 each, which includes shipping to any USA location. 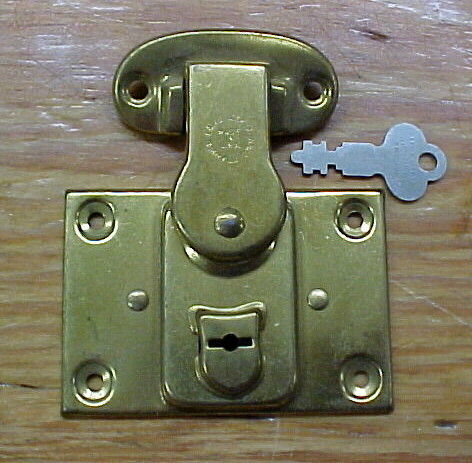 Everlasting Lock Co trunk lock; surface mount main lock, receiver requires a mortise (hole). Has a cool space for an address or contents card. Long Lock Co military footlocker lock; surface mount. each comes with one key. Lock-097, $60 each, USA shipping included. Eagle Lock Co original locks from the 1920s, smaller locks for humidors, tackle boxes, tool boxes, and briefcases. The nickel/silver one has a backplate that's 2-3/4" wide by 2" tall, and the black ones have a backplate that's 2-1/4" wide by 2" tall. Each of these locks comes with one working key. No fasteners included. Sold out of black. 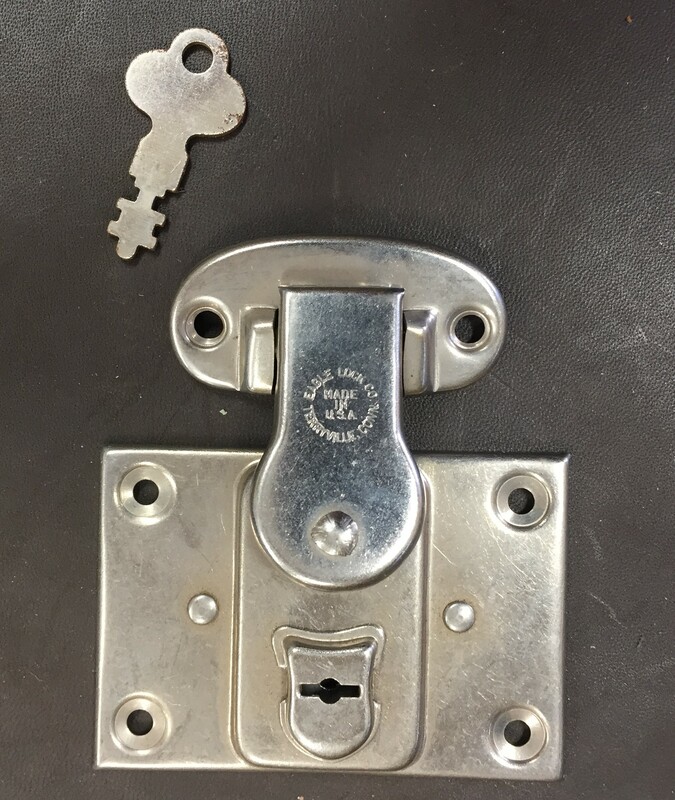 Lock 103 in nickel plate $45.00 each. USA shipping is included in our prices. existing pin on your trunk or you'll have to fabricate some way to attach it. Looks like a ten penny nail would fit through the cylindrical opening. Backplate measures 4-1/2" wide by 2-9/16" tall. Shaft length of mounting pin will need to be 1-1/4" long. Lock 107 $85.00, USA shipping included. Sold as a box lot only. Mostly brass plated steel, a few nickel plated steel. TP-161 $75.00, USA shipping is FREE! USA shipping is included in our prices. Small trunk or box lock from Excelsior Lock Works. Overall dimensions are about 2-1/16" wide by 3-3/16" tall. Comes with one working key. Lock 117 $65 each, USA shipping included. Small trunk or box locks, maker unknown. Overall dimensions are about 2-1/8" wide by 3-1/8" tall. Comes with one working key per lock. Lock 118 $30 each, USA shipping included. Small trunk or box locks, various styles. Overall dimensions are about 2-3/4" wide by 3-1/2" tall. Each lock comes with one working key. Lock 130, styles A through F, $30 each, USA shipping included. Lock-130F is the lower right photo. This is a modern reproduction of an old blanket chest lock, with a double throw (turn the key all the way around twice to unlock). Fits in a mortise. Overall dimensions of the lock body are about 3 x 5 inches, and it's about 3/4" thick. Comes with one key. Lock 126 $75, USA shipping included. Typical trunk locks, from the late 1800s, these have seen very little use, we believe, because they aren't beat up too badly. One key comes with each lock. One has a hasp for a padlock, the other doesn't; take your pick, $75 each, USA shipping included. Lock 131A (with hasp) and Lock 131B (no hasp) $75 each, USA shipping included. LOCK-133: Common on smaller dome top trunks, from the mid-to-late 1800s, these still work well. One key comes with each lock. Each piece of these was made by hand, typically by a blacksmith. Back plate is about 2-7/8" wide and 2" tall. $75 each, USA shipping included. LOCK-119: Common on smaller cases and doll trunks, from the late 1800s. Comes with one key. Back plate is about 2-3/4" wide and 2" tall. $65 each, USA shipping included. Only one left in stock. LOCK-134: Rather large backplate and lock set from about 1890. Comes with one key. Backplate and lock have been painted flat black. Lines in the background are inches. $100, USA shipping included. LOCK-135: Typical steamer trunk locks with loop for a padlock, made right around 1910 we think. Comes with one key. Overall dimensions of the closed lock are 3-5/8" wide by 6-3/4" tall. $65 each, USA shipping included. LOCK-136: This one was made by Harris Lockworks, and is sized like a typical steamer trunk lock. Comes with one key. Overall dimensions of the closed lock are 3-15/16" wide by 6-3/8" tall. $65, USA shipping included. 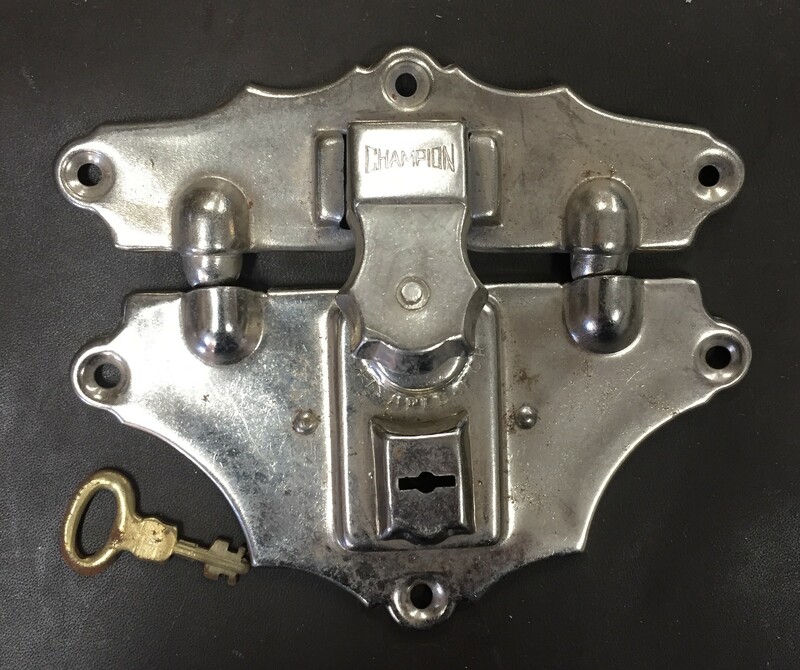 LOCK-137: These were made by Excelsior of Stamford, CT in the 1920s but were never installed on a trunk. New old stock. Each lock comes with one key. Black finish. Overall dimensions of the closed lock are 3-1/2" wide by 6-1/2" tall. $65 each, USA shipping included. LOCK-138: These were made by Eagle Lock of Terryville, CT in the very early 1900s and were never installed on trunks, but we recovered them from our trunk graveyard. These require a round mortise (fancy word for a hole) for the lock to fit into when closed. Brass plated finish that's showing its age, as you can see. Overall dimensions of the closed locks are 3-3/4" wide by 6-1/2" tall. $75 each, USA shipping included. Note we also have one with no receiver: $45 for that one. LOCK-139: These were made by Excelsior Lockworks in the 1930s and 40s but were never installed on trunks. They're what we call 'New Old Stock.' These mount flat on the front of the footlocker/trunk. Some trunks use just one, some use two. Olive Drab finish. Overall dimensions of the closed locks are 2-1/4" wide by 3-1/4" tall. $30 each, USA shipping included. Comes with one key per lock. In the photo the lines are one inch squares.